Technological advancement in treatment planning enables us to tailor the dose to fit the target with minimal dose to critical organs. ,, Nevertheless, the actual dose delivery to patient may not be same like planned one because of various associated uncertainties in radiotherapy treatment chain; and one of the major sources of uncertainties is respiration induced target motion. This respiratory motion is an obstacle for delivering highly conformal dose to the target in upper abdomen and thoracic regions. ,,, Further, the respiratory motion would produce interplay effect in dynamic treatment deliveries such as IMRT; which may cause cold or hot spots in the treatment region. And this negates the true benefits offered by IMRT techniques. The electron beam is extensively used in postmastectomy chest wall irradiation because of its finite range of penetration; ,, It also reduces cardiac and lung toxicity. Further, modulated electron radiation therapy (MERT) has been proposed for delivering highly conformal dose to targets while sparing normal tissues. ,,,, Ma et al., used the MERT for planning the breast cancer treatments and it was shown that the MERT was superior to photon IMRT in reducing the lung and heart dose. In MERT, the lateral conformity and uniformity may be achieved by intensity modulation and conformity in depth direction may be improved by energy modulation. Observations revealed that chest wall moves due to respiration and this may degrade the dose distribution. ,, Unlike photons the electron beam could be more susceptible to respiratory motion; hence electron treatments in the thoracic regions may need to incorporate respiratory motion management. The gated method was successfully implemented for photon radiotherapy treatments. The gating can also be exploited for electron beams as like in photon treatments. This would decrease the internal target volume and reduce the dosimetric uncertainties of respiratory motion. Ramsey et al., emphasized that the dosimetric performance of any gated delivery should be evaluated and compared with non-gated operation before clinical implementation. The comparisons of dosimetric characteristics of gated photon beams with nongated beams were reported earlier , and no clinically significant dosimetric deviations were observed; this ensured the accuracy of X-ray photon beam gating. Similar comparisons should be carried out for electron gated treatments to understand its dosimetric accuracy. To the best of our knowledge, there is not a single study available at present for electron beam gated treatments. Therefore, the aim of this study was to compare the gated electron beam dosimetric characteristics such as beam output, symmetry and flatness with the non-gated electron beams. Evaluations were carried out for various dose rates and breathing periods. The electron beam gated delivery was performed in a medical linear accelerator (CL2100CD, Varian Medical Systems, Palo Alto, CA). The linac is equipped with five electron energies (4, 6, 9, 12 and 16 MeV) and dual X-ray photon energies (6 and 15 MV). The point doses and dose profiles (in-plane and cross-plane) of all electron energies were measured for total monitor unit of 100 MU under gated operation for three dose rates (100 MU/min, 300 MU/min and 600 MU/min), two respiratory motions (breathing period of 4 s and 8 s). Gated treatments were performed using Real-time position management (RPM) system (Varian Medical Systems, Palo Alto, CA). Respiratory motion was simulated using QUASAR motion platform (Modus Medical Devices Inc., Canada). The RPM system consists of six dot passive marker block which was placed over the moving chest wall of QUASAR phantom. A wall mounted infra-red camera captures the motion of marker block for producing the motion pattern of QUASAR phantom. A gating window of 25% duty cycle was programed on the respiratory wave. Flatness and symmetry values of gated electron beam deliveries were measured using Imatrixx 2D ion chamber array device (Scanditronix Wellhöfer, Freiberg, Germany) which was sandwiched between perspex slab phantoms. This 2D array was placed over the QUASAR motion platform which was programed to move in the cranio-caudal direction (along the Gun-Target direction) for simulating the respiratory motion. [Figure 1]a shows the experimental setup of dose profile measurement. The respiratory motion considered in this study was having breathing period of 4 s and 8 s with a peak to peak amplitude of 2 cm. The 2D fluence measurements were carried out for 20 × 20 cm 2 applicator at respective reference depths (Z ref). The point dose measurements were carried out using plane parallel ion chamber (Markus, PTW, Germany) which was placed in appropriate slab phantom holder. The whole phantom system was placed over motion platform which was programed to mimic the above assumed respiratory pattern. [Figure 1]b shows the experimental setup of point dose measurement. The point dose measurements were carried out for 10 × 10 cm 2 applicator at respective reference depths (Z ref ). The accuracy of gated electron beam deliveries was determined by comparing the gated delivery dosimetric characteristics with corresponding non-gating (no phantom motion) deliveries. It was shown that the beam output of gated delivery of photon beam was deviated larger with respect to non-gated delivery when delivering low number of MU (2 MU) in the gating window. Hence, we have experimented effect of low MU settings in the electron gated delivery. 2D profile and point doses were also measured for a total 10 MU with the gating duty cycle 10%, dose rate 300 MU/min and breathing period 4 s.
Dosimetric characteristics of gated (25% duty cycle) and non-gated electron beam treatments were compared for three different dose rates (100 MU/min, 300 MU/min and 600 MU/min) and two breathing periods (4 s and 8 s). [Figure 2]a and b show in-plane and cross-plane dose profiles of 9 MeV electron beam at a dose rate of 300 MU/min and breathing period 4s for gated and non-gated deliveries. [Table 1]a and b show the variation in beam flatness and symmetry values for all electron energies and various dose rates at 4 s breathing period. Similarly the [Table 2]a and b show the beam flatness and symmetry values for 8 s breathing period. It was observed that the dose profiles of gated delivery are in good agreement (<0.7%) with the corresponding non-gated delivery [refer [Table 1] and [Table 2]. The maximum deviation of 0.7% was observed in flatness for the electron energy 6 MeV at a dose rate of 100 MU/min and breathing period of 4 s. Similarly the maximum symmetry deviation was 0.7% for the electron energy 12 MeV at a dose rate of 100 MU/min and breathing period of 8s. There was no dose rate and breathing period dependency observed in the gated delivery. The dose profiles ([Table 4]a) of low MU setting was also in good agreement with corresponding non-gated delivery. The percentage deviations of beam output of gated delivery were calculated with respect to corresponding non-gated deliveries. [Table 3] shows the beam output deviations for all electron energies, dose rates and breathing periods. Similar to 2D profile results, the beam outputs of gated deliveries were also similar to corresponding non-gated deliveries except for 16 MeV. The gated output deviation with respect to non-gated delivery was within 0.6% for all electron energies except for 16 MeV; which had the deviation of 1.4% for the dose rate of 600 MU/min. 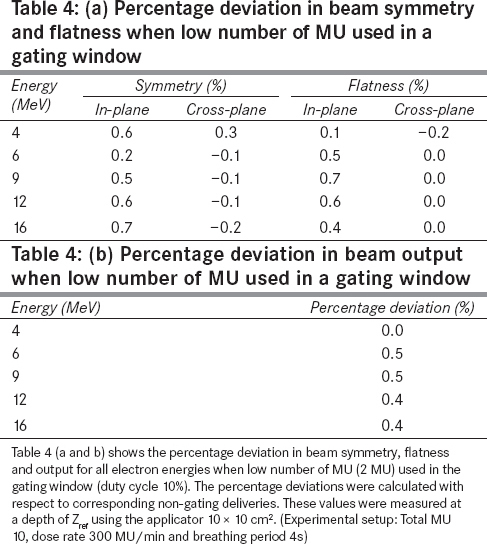 Further, it was observed that the beam output deviations of low MU setting ([Table 4]b) was also less (<0.5%). The dosimetric accuracy of gated electron beam deliveries was evaluated for various dose rates and respiratory motion periods in a medical linear accelerator. The 2D dose profiles and point doses of gated delivery were compared with corresponding non-gated deliveries. The results of this study indicate that the linac is well suitable for non-dynamic electron gated deliveries. In this study, the maximum point dose deviation was observed for the electron energy 16 MeV and this could be due to the temperature rise in the linac system during high energy electron beam delivery. In addition, the gating on the 16 MeV electron beam further increased the temperature and internal water temperature during measurement was around 43 ° C. Whereas for other electron energies, the internal water temperature was ~40 ° C; hence we could not observe any dose deviation. To substantiate this, a non-gated experiment was carried out with different internal water temperatures. 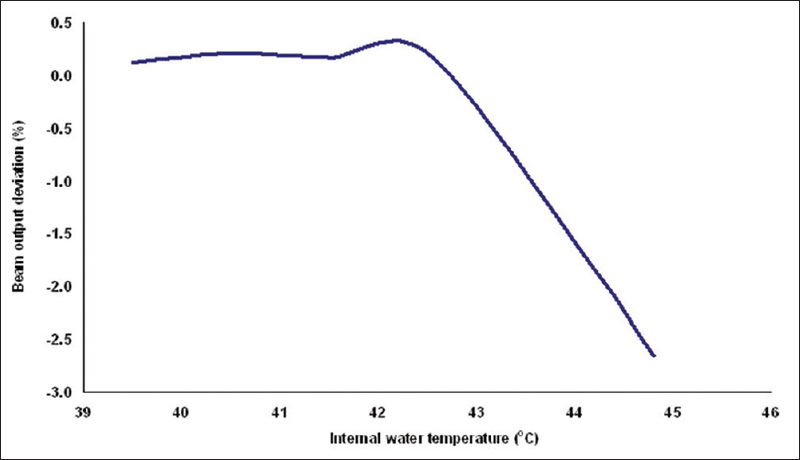 Initially, a point dose was measured for 100 MU with a dose rate of 600 MU/min at an internal water temperature of 40.5 ° C and this was considered as reference. The linac was programed to deliver around 3500 MU continuously to rise the internal water temperature to ~45 ° C. The point dose was measured as function of internal water temperature. The beam output percentage deviations were calculated with respect to reference dose (that is at 40.5 ° C) and the [Figure 3] shows the results. It was observed that the dose deviation between 45 ° C and 40.5 ° C was -2.7%. This showed that the dosimetric characteristics of electron beam depend on the temperature of the linac components; hence the energy dissipation and temperature of linac components should be maintained constant. In this study, we have not evaluated the temperature effect for other energies; because for other low energies the cooling system of linac was able to maintain the temperature with gated delivery. Gating in electron beam would be a standard method in near future when we use highly conformal electron treatments such as MERT. This study includes only open beam for evaluation. And the use of add-on 'MLC' for delivering the electron IMRT was also being explored. The gating process with electron IMRT would further complicate the process. A separate study is required to evaluate the electron gating with dynamic treatments. In addition, the Imatrixx has finite resolution of 7.62 mm (ion-chamber center to center distance); hence using a film may have advantage (especially for MERT) for the measurement of electron dose blurring accurately. The dosimetric characteristics of gated electron beam delivery were evaluated for various dose rates and respiration periods. The flatness and symmetry of all the evaluated electron energies did not differ by more than 0.7% with respect to corresponding non-gated deliveries. The output variation of gated electron beam was less than 0.6% for all electron energies except for 16 MeV (1.4%). The results of this study indicate that the Varian CL2100CD is well-suitable for gated delivery of non-dynamic electron beams. The authors would like to acknowledge the assistance received from the Department of Science & Technology, Grant No: IR/SO/LS 02/2003, Government of India. Webb S. The physical basis of IMRT and inverse planning Br J Radiol 2003;76:678-89. Blanco AI, Chao KSC, "Intensity-Modulated Radiation Therapy and Protection of Normal Tissue Function in Head and Neck Cancer," Perez CA, Brady LW, Eds., Principles and Practice of Radiation Oncology Updates, Lippincott Williams & Wilkins Healthcare, New York, 2002. Galvin JM, De Neve W. Intensity modulating and other radiation therapy devices for dose painting. J Clin Oncol 2007;25:924-30. Bortfeld T, Jokivarsi K, Goitein M, Kung J, Jiang SB. Effects of intra-fraction motion on IMRT dose delivery: Statistical analysis and simulation. Phys Med Biol 2002;47:2203-20. Jiang SB, Pope C, Al Jarrah KM, Kung JH, Bortfeld T, Chen GT. An experimental investigation on intra-fractional organ motion effects in lung IMRT treatments. Phys Med Biol 2003;48:1773-84. Das, Maria KJ, Agarwal A, Yoganathan , Gowtham RD, Kumar S. Investigation of Inter and Intra-fractional Uncertainties in Lung IMRT delivery. In World Congress on Medical Physics and Biomedical Engineering May 26-31, 2012, Beijing, China: Springer Berlin Heidelberg; 2013. p. 1857-9. Yang W, Van Ausdal R, Read P, Larner J, Benedict S, Sheng K. The implication of non-cyclic intrafractional longitudinal motion in SBRT by Tomo Therapy. Phys Med Biol 2009;54:2875-84. Shih HA, Jiang SB, Aljarrah KM, Doppke KP, Choi NC. Internal target volume determined with expansion margins beyond composite gross tumor volume in three-dimensional conformal radiotherapy for lung cancer. Int J Radiat Oncol Biol Phys 2004;60:613-22. Wong JW, Sharpe MB, Jaffray DA, Kini VR, Robertson JM, Stromberg JS, et al. The use of active breathing control (ABC) to reduce margin for breathing motion. Int J Radiat Oncol Biol Phys 1999;44:911-9. Ohara K, Okumura T, Akisada M, Inada T, Mori T, Yokota H, et al. Irradiation synchronized with respiration gate. Int J Radiat Oncol Biol Phys 1989;17:853-7. Keal PJ, Kini VR, Vedam SS, Mohan R. Motion adaptative x-ray therapy: A feasibility study. Phys Med Biol 2001;46:1-10. Schweikard A, Glosser G, Bodduluri M, Murphy MJ, Adler JR. Robotic motion compensation for respiratory movement during radiosurgery. Comput Aided Surg 2000;5:263-77. Souza WD, Naqvi , Yu Real-time intrafraction motion tracking using the treatment couch: A feasibility study. Phys Med Biol 2005;50:4021-33. Yoganathan SA, Maria Das KJ, Agarwal A, SK Senthil Kumar, Velmurugan J, Kumar S. Synchronization of Intra-fractional motion in dynamic IMRT delivery. IFBME Proc 2012;39:1923-5. Yoganathan SA, Das KJ, Agarwal A, Kumar S. Performance evaluation of respiratory motion-synchronized dynamic IMRT delivery. J Appl Clin Med Phys 2013;14. Keall PJ, Mageras GS, Balter JM, Emery RS, Forster KM, Jiang SB, et al. The management of respiratory motion in radiation oncology, report of AAPM Task Group 76. Med Phys 2006;33:3874-900. McNeely LK, Leavitt DD, Egger MJ, Stewart JR. Dose volume histogram analysis of lung radiation from chest wall treatment: Comparison of electron arc and tangential photon beam techniques. Int J Radiat Oncol Biol Phys 1991;21:515-20. Lee MC, Jiang SB, Ma CM. Monte Carlo and experimental investigation of multileaf collimated electron beams for modulated electron radiation therapy. Med Phys 2000;27:2708-18. Ma CM, Ding M, Li JS, Lee MC, Pawlicki T, Deng J. A comparative dosimetric study on tangential photon beams intensity-modulated radiation therapy (IMRT) and modulated electron radiotherapy (MERT) for breast cancer treatment. Phys Med Biol 2003;48:909.
du Plessis FC, Leal A, Stathakis S, Xiong W, Ma CM. Characterization of megavoltage electrons delivered through a photon multi-leaf collimator (pMLC). Phys Med Biol 2006;51:2113-29. Gauer T, Albers D, Cremers F, Harmansa R, Pellegrini R, Schmidt R. Design of a computer-controlled multileaf collimator for advanced electron radiotherapy. Phys Med Biol 2006;51:5987-6003. Liu Q, McDermott P, Burmeister J. Effect of respiratory motion on the delivery of breast radiotherapy using smlc intensity modulation. Med Phys 2007;34:347-51. Sidhu S, Sidhu NP, Lapointe C, Gryschuk G. The effects of intrafraction motion on dose homogeneity in a breast phantom with physical wedges enhanced dynamic wedges and ssIMRT. Int J Radiat Oncol Biol Phys 2006;66:64-75. Wang W, Bin Li J, Hu HG, Sun T, Xu M, Fan TY, et al. Evaluation of dosimetric variance in whole breast forward-planned intensity-modulated radiotherapy based on 4DCT and 3DCT. J Radiat Res 2013;54:755-61. Ramsey CR, Cordrey IL, Oliver AL. A comparison of beam characteristics for gated and nongated clinical x-ray beams. Med Phys 1999;26:2086-91. Kriminski S, Li AN, Solberg TD. Solberg. 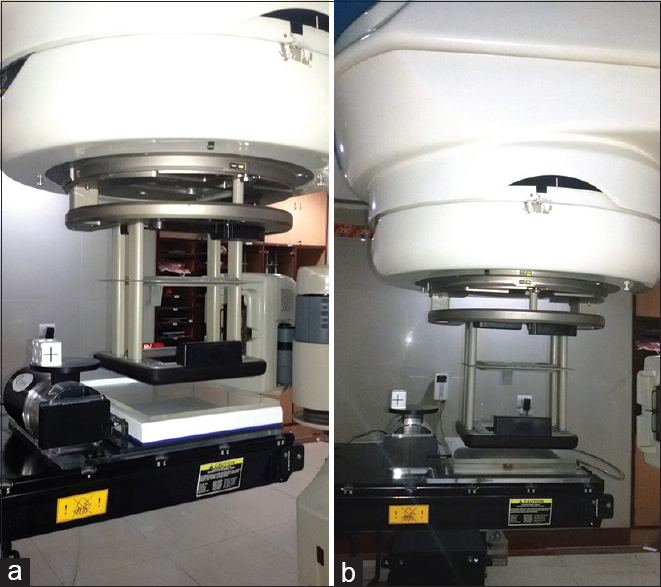 Dosimetric characteristics of a new linear accelerator under gated operation. J Appl Clin Med Phys 2006;1.